The Galapagos Islands are not only rich in history, but also rich in the incredible variety of weird and unusual animals. Located off the coast of Ecuador and South America, on the Pacific Ocean, these islands were made famous by the British scientist Charles Darwin, who partly developed his theory on evolution during a visit there in 1835 on the HMS Beagle. Perhaps 5 of the weirdest and most famous animals inhabitants of the islands are the Galapagos Tortoise, the Galapagos Finch, the Marine Iguana, the Lava Lizards and the Flightless Cormorant. 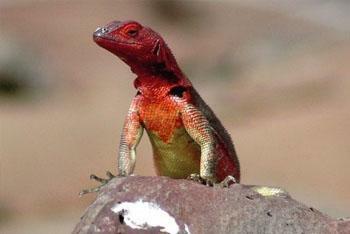 This is article will describe each peculiar animal and point out their unusual contributions to science and evolution. The Galapagos Tortoise is the largest living species of tortoises in the world, weighing up to 700 pounds and can live for over 100 years. 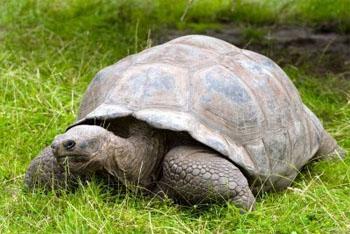 The term Galapagos actually is translated into Spanish as tortoise. When Charles Darwin visited the islands, one of the native leaders informed Darwin that he was able to distinguish which of the islands of the Galapagos a tortoise lived simply by looking at the shell. Darwin was able to surmise that all of the tens of thousands of tortoises on the islands evolved from a single species into the 14 identified subspecies with 11 subspecies still alive today. The Galapagos Finch is another amazing example at evolution in progress. 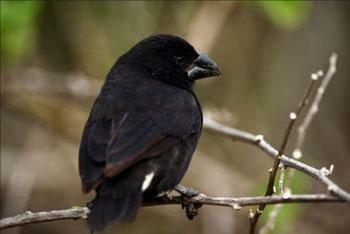 There are 14 different species of the Darwin Finches but their beaks vary in size and shape, which distinguishes the different species. Again these different species evolved from a single species of finch but adapted their beaks to their respective island’s climates, and types of food. The Marine Iguana is one of the few remaining marine reptiles in existence. Darwin theorized that the typical land dwelling Iguanas from South America had evolved into a species that swim in the sea! 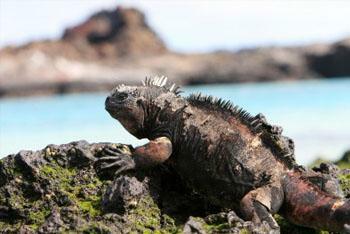 In fact the Marine Iguana are the only species Iguana that feeds in the sea, almost exclusively feeding on algae. They are also distinctive in appearance with a white looking substance on their heads, which is the excess salt they discharge from their mouths. Lava Lizards can be found crawling the rocks of the Galapagos Islands constantly searching for beetles and other unlucky prey. Lava Lizards are also quite unique in that there are 7 species of these lizards on the islands but a single distinct species on each island. Again Darwin theorized that all 7 species evolved from a single species but adapted to each island’s distinctive climate and environment. And last of these 5 oddities is the Flightless Cormorant. This type of bird is unique in that it is the only cormorant that is unable to fly. 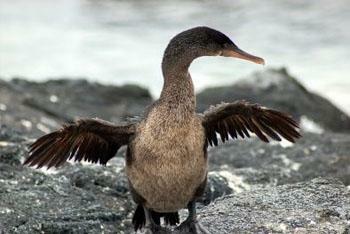 The Flightless Cormorant had adapted to their environment and now uses their wings to swim as opposed to flying. Unfortunately this bird is likely the most endangered of the 5 other species listed above. And so despite only 5 animals of the Galapagos are listed here, there are several other unusual inhabitants living on the Galapagos. There is no wonder why Charles Darwin was able to base many of his theories on this literal fantasy island.